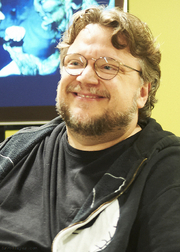 Guillermo Del Toro. Photo courtesy Canadian Film Centre. This month, Schuler’s horror reading group is looking at The Strain by Guillermo Del Toro and Chuck Hogan. Guillermo del Toro signs The Strain. Guillermo del Toro's book The Strain was available from LibraryThing Early Reviewers. Guillermo del Toro is currently considered a "single author." If one or more works are by a distinct, homonymous authors, go ahead and split the author. Guillermo del Toro is composed of 11 names. You can examine and separate out names.